To update a file's or folder's permissions right-click on it and select "Permissions" to open the permissions window. Use the "Add Entry" and "Remove Entry" to add or remove a user group from the permission list. To modify the permission level of an existing entry, simply click in the Permission column to open the drop-down permission level selector as depicted here. If you wish to apply the permissions change to both the target folder and every subfolder underneath it then check the first checkbox labeled "Apply recursively..."
If you wish to also the permissions change to all the files under those folders then check the second checkbox. If you check only the second but not the first checkbox then your change will be made to the selected folder and the files in that folder but not to any subfolders or files in those subfolders. 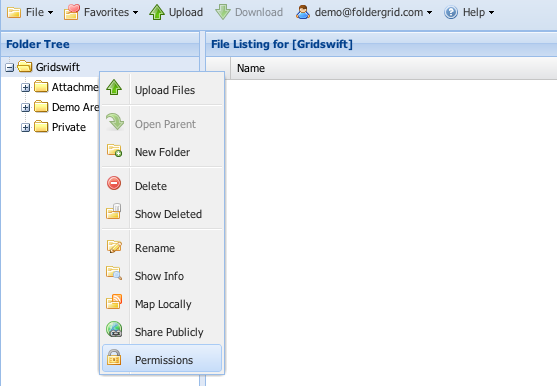 FolderGrid supports fine-grained user permissions for every file and folder. (WRITE) Allows grantee to create new items in the folder. WRITE implicitly grants READ. Allows grantee to create new versions of the file. WRITE implicitly grants READ. (FULL_CONTROL) Allows grantee the READ, READ_ACP, WRITE, and WRITE_ACP permissions on the folder. Allows grantee to move, rename, and delete the folder. Allows READ, READ_ACP, WRITE, and WRITE_ACP permissions on the file. Allows grantee to move, rename, and delete the file. (WRITE_ACP) Allows grantee to modify/grant permissions on the folder. WRITE_ACP implicitly grants READ_ACP. Allows grantee to modify/grant permissions on the file. WRITE_ACP implicitly grants READ_ACP. By default, newly created files inherit their permissions from their parent folder. By default, newly created folders do not inherit from their parent folder but can be configured to do so by adjusting the "Subfolders Inherit Permissions" folder property. Every user is automatically added to the "All Users" group. By default, the "All Users" group is granted READ access to the root folder on your domain. Without this READ permission on the root folder, a user would not have a clear path to any other files or folders on the domain. Administrators should keep in mind that under these default settings, all users have the ability to see metadata for all files and folders directly within the root folder. We recommend creating subfolders for any files or folders with private metadata and then simply restricting READ & WRITE privileges on those subfolders. However you also have the option of setting home folders for individual users and avoiding the need to establish a clear path from root for the given user.